There is a positive commandment to set up a mezuzah on every doorpost. The details as to which doorways, how the mezuzah should be placed, and the bracha are described below. 3.3 Which Is the Right Side? If a room is four by four amot even if there large items such as a refrigerator or oven in that room and it is normally there and enables the room to be used normally it is obligated in a mezuzah. If a doorway only has one doorpost, such as if the lintel is connected to a wall, then if the standing doorpost is on the right, one should put up a mezuzah without a bracha or recite a bracha when putting up a mezuzah in a doorway that is obligated and then put up this mezuzah. If the standing doorpost is on the left, that doorway isn't obligated in a mezuzah. A regular doorway has two doorposts and a lintel (see the picture to the left). If the doorway has two doorposts and there is no lintel but the area has a roof (see the picture to the right), if the roof comes to an edge at the point of the door some say that one should put up a mezuzah, while others hold that doesn't require a mezuzah. Therefore, a mezuzah should be put up without a bracha. A small closet, such as a linen closet or electricity closet, that a person doesn't enter and only uses by takes things out of it isn't obligated in a mezuzah. However, if it is a large closet that is 4 by 4 amot and a person enters is obligated in a mezuzah without a bracha. A storage room requires a mezuzah. If there's a storage room such as an attic that you only use twice a year it is considered as though he doesn't use it at all and it doesn't require a mezuzah. However, if it is used more frequently such as once a month then it is obligated. A garage is obligated in a mezuzah without a bracha since it is used for storage. A mezuzah should not be put up by the doorway to a bathroom, mikveh room, or a room people wash in and stand there undressed. A bedroom should have a mezuzah. A shul doesn't need a mezuzah unless people live in the shul building. A bet midrash doesn't need a mezuzah but because some rishonim hold that it should have a mezuzah it is proper to put up a mezuzah on a bet midrash without a bracha. The reason that the bet midrash is different than a shul is since talmidei chachamim use it day and night they consider it like their home. According to many poskim an office or store is obligated in a mezuzah even if it is only opened by day. However, since some poskim hold that it doesn't require a mezuzah if it isn't used by night in such a case a mezuzah should be put up without a bracha. A factory is the same as a store for the purposes of mezuzah. Some say that a school requires a mezuzah just as a store does. An elevator is obligated in a mezuzah from the elevator shaft to the building. The doorway to a courtyard or city is obligated in having a mezuzah on the right side as one enters. In a city that has some non-Jews the city gate does not need a mezuzah. The electrical posts used for an eruv do not need a mezuzah even though they function as a doorway. If there are polls or arch in the middle of a room that creates a doorway if the two halves of the room are used for the same purpose there is no obligation to put up a mezuzah on the polls, however, if the polls separate the room in two and they are used for different uses then the doorway created by the polls requires a mezuzah. One may put up a mezuzah at night. Which Is the Right Side? From Exempt to Obligated: Any door that goes from a place that is exempt from mezuzah to a place that is obligated in mezuzah should have the mezuzah on the right side entering into the place that is obligated in mezuzah. For example, the mezuzah on the front door or back door of a house is always placed on the right side going into the house since the house is obligated in mezuzah and the street isn’t. A walk-in closet which is less than 4x4 amot the mezuzah is put on the right side going from the closet into the room since the closet isn’t obligated. Entry: The mezuzah should be put up on the doorpost which is to one's right upon one's entering the house. This criteria applies equally to the outer doors of the house to the rooms inside the house. For example, a room that only has one entrance obviously has the mezuzah placed on the right side going into the room. 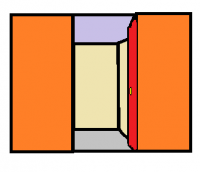 Usage: If a room has two doorways if one of the two rooms that it connects is used more frequently then the mezuzah should be put up on the right side going into the room that is used more frequently. Majority of Walking: If the position isn't determined by entry or by which is used more frequently it can be determined by which room people walk from one room to another; if majority of the times people enter in one direction the mezuzah is placed on the right of that direction. 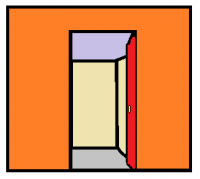 Doorway: If the position of the mezuzah cannot be determined based on which direction is used for entry or which room is used more frequently it can be determined by the door. Since the door generally swings into the room (besides the outermost door of the house) the way the door swings can be considered the way one enters the room and the mezuzah is placed on the right side entering the room. However, if the mezuzah is determined based on the previous factors it doesn't matter which way the door swings. Doubt: If it is impossible to determine which side to put up the mezuzah based on the criteria of (1) whether the door is used more for entry or exiting, (2) which of the two rooms that the door connects is used more frequently, and (3) the door hinges because the door is used equally for entry and exiting, the two rooms are used equally and there is no door, according to some poskim there is no obligation to put up a mezuzah at all. Some poskim write that one should put up a mezuzah on both sides, but other poskim write that may not do so since it is [Bal Tosif], adding onto a mitzvah. The side on which the mezuzah is placed depends on the norm of the people who use the house whether they own it, live there, are obligated in mezuzah or not. It doesn't depend on which way the homeowner wants to be the main direction of entry; it solely depends on which direction is used for more for entry in practice by the people who use it. If the mezuzah was placed on the left side of the door it needs to be taken down and put up on the right side with a bracha. If there's a back door that opens to an enclosed backyard that is completely closed then the mezuzah should be placed on the right side going into the backyard. If the back door opens into a backyard that has a gate to a courtyard or street then the back door should have a mezuzah on the right side going into the house because the house is used more than the backyard. A balcony or deck that opens to a house and has no other entrance or exit should have a mezuzah on the right going from the house to the balcony. Even if the balcony is less than 4x4 amot and isn't roofed, according to Sephardim, the mezuzah should be placed on the right side going from the house to the balcony. Ashkenazim hold that if the balcony is less than the equivalent of 16 square amot the mezuzah should be put on the right side going from the balcony to the house. If a closet is 4x4 amot it is certainly obligated in a mezuzah. There is a dispute if a closet less than than 16 square amot is obligated in a mezuzah since it is useful in its current form. Many assume it isn’t obligated but the minhag is to put up a mezuzah. Most poskim hold that an area 2x8 amot is obligated in a mezuzah. If the closet is obligated in mezuzah which way should the mezuzah be? Should it be on the right side since it is a dead end or should it have a mezuzah on the left side since the room is used more than the closet? Most poskim hold that the mezuzah should be placed on the right side going into a closet if the closet is obligated in mezuzah. Therefore, a closet that is 4x4 amot or larger clearly needs a mezuzah and the mezuzah is placed on the right side going into the closet. A closet that is 2x8 amot or any shape that encloses 16 square amot but doesn’t enclose 4x4 amot is obligated in a mezuzah according to most poskim and as such the mezuzah should be placed on the right side going into the closet according to most poskim. A closet that is less than 4x4 amot according to Ashkenazim the closet is primarily exempt from mezuzah and as such the mezuzah is placed on the right side coming out of the closet. However, according to Sephardim the mezuzah is placed on the right side going into the closet since the closet might be obligated and even if it isn’t it might require a mezuzah on the right side. The mezuzah should be placed at the beginning of the upper third of the height of the doorway but it should be placed at least a Tefach from the top of the doorway. If it is not in the top third it isn't kosher. If it isn't a tefach from the top of the door it should be fixed. If a doorway is very tall, according to Ashkenazim, one should put up the mezuzah at shoulder height. However, according to Sephardim, one should place it in the upper third in all circumstances. 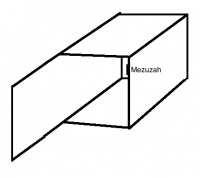 If the height of the arch is more than one third of the height of the entire doorway so that it isn't possible to satisfy both opinions the primary opinion is to place the mezuzah two thirds up the vertical part of the doorway excluding the arch. If there are doorposts which are ten tefachim but they don't reach the ceiling and there is a wall which reaches the ceiling the mezuzah should be placed on the doorposts and not the wall (spot ב in the picture). One should have one's Mezuzot checked by a sofer twice in seven years, or once in every three and a half years, and it is a pious practice to check them every year during Elul. If one's mezuzah became wet one should check it immediately. The mezuzah's of a publically owned building only need to be checked twice in fifty years. Ideally Ashkenazim should get mezuzot with a ketav (handwriting) that is Ashkenazic and Sephardim the Sephardic ketav. If one uses the other one it is still valid. In general, before putting up a Mezuzah in a doorway that is obligated in a mezuzah, one should recite the bracha. However, if one is putting up a mezuzah on a doorway that doesn't have a door or a doorway that leads into an area that doesn't have 4 by 4 amot square, no bracha is recited. If one took down one's Mezuzot in order to have them checked by the sofer and they were found to be kosher, according to Ashkenazim one should put them back up without a Bracha of Lekvoh Mezuzah. According to Sephardim, one should make a bracha upon putting them back up after being checked by the sofer. If one checks the mezuzah by himself, he need not say a new beracha. If a mezuzah was found to be not kosher, then a beracha is recited when it is replaced with a kosher one. Please note that a bracha is only said when replacing the mezuzah if the doorway has a door and the room is at least 4 by 4 amot in size. (See above #The Bracha on putting up a Mezuzah). However, if one took down one's Mezuzah just to put it in a nicer case, one doesn't need to make a new Bracha when putting it up unless it was taken down for several hours so that one stopped thinking about the Mezuzah. If a mezuzah was taken down for plastering or repainting the door for a few days it should be put up again with a bracha. If someone is renting a house in Israel he is obligated to put up a mezuzah with a bracha immediately. However, if one is renting outside Israel for less than 30 days isn't obligated to put up a mezuzah and if he wishes to be strict to put a mezuzah he should do so without a bracha. If he stays for more than 30 days and he put up a mezuzah previously he should make a bracha upon the mezuzot. Some say that one has to take down the mezuzah and put them up again and some say that one doesn't have to take it down to make a bracha upon it. It is proper to take it down check them and put them back up with a bracha. If someone is renting a house for more than 30 days, he is obligated to put up a mezuzah immediately. He does not recite a bracha if he puts it up within 30 days. Someone renting a bungalow for more than 30 days must put up mezuzah but some hold that no bracha is recited. A yeshiva dormitory requires mezuzot and they should be put up by the yeshiva and not the students. A Jew who owns a building in partnership with a non-Jew according to Ashkenazim is exempt from mezuzah, but according to Sephardim is obligated to put up a mezuzah. Ideally, a child should not place the mezuzah on a doorpost. Sephardim hold that the child should put up the mezuzah for his doorway and when he becomes bar mitzvah'ed it should be taken down, checked, and put up again with a bracha. The doorway to a child's room should have a mezuzah for chinuch. In a room where the baby is changed if the mezuzah is on the inside of the door it should be covered. Even though it is technically permitted to have a child potty in a room with a mezuzah since the mezuzah is covered and above 10 tefachim it isn't proper to do so. If a person is moving and another Jew is moving in one must leave them your mezuzot.The reasoning is that you shouldn't remove mezuzot is because they are used to serve to protect the house from harm and taking them indicates that you don't care about those moving in or that mezuzot represent that the divine presence resides in the home and that isn't something one should remove. It is permitted to take down the old mezuzah, have them checked, and then put up just kosher ones, and take the old ones with you. There is an opinion that you may take down the mezuzot in you're going to put them up in another house, however, that opinion isn't accepted as the halacha. ↑ Rambam Sefer HaMitzvot Positive Commandment 15, Sefer HaChinuch Mitzvah 423, Kitzur Shulchan Aruch 11:1 from Devarim 6:9 and 11:20. Shulchan Aruch YD 285:1, Chayei Adam 5:13, Aruch Hashulchan 285:2 say that one should be very meticulous with this mitzva. Tur YD 285 writes based on the pasuk that follows in Parashat Ekev, 11:21, that one who is meticulous in this mitzva merits long life. Bach YD 285 and Aruch Hashulchan YD 285:3 write that a house with a mezuzah has extra protection. ↑ Maharil (responsa 94) bemoans the fact that many people think that it is sufficient to have one mezuzah per house when in fact every doorway requires its own mezuzah. The Darkei Moshe 286:4 cites the Maharil. Kitzur Shulchan Aruch 11:1 concurs. ↑ Chaye Adam 15:15 writes that a cellar door on the floor is exempt from mezuzah based on Kiddushin 22b that states that a doorpost lying on the ground isn't considered a doorpost. Kitzur Shulchan Aruch 11:20 and Aruch Hashulchan YD 286:41 concur. ↑ Rav Zilberstein (Tuvcha Yabiu - Hilchot Shecheinim 34) says that even if the elevator itself is not 4 by 4 amos- the doorpost from the hallway that leads into the elevator requires a mezuzah. However, Rav Moshe Stern (Be'er Moshe 2:88) says that no matter what an elevator will never require a mezuzah. ↑ Kitzur Shulchan Aruch 11:10 records a dispute between the Rambam and Rosh on this matter. 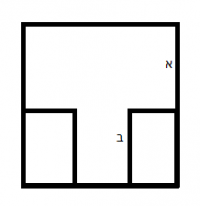 Shulchan Aruch YD 296:13 writes the opinion of the Rambam that if the room has an area of 4 by 4 amot even if it isn't a square it is obligated in a mezuzah. The Shach 296:23 notes that the opinion of the Rosh is that the doorway isn't obligated unless there is a 4 by 4 amot square area. Due to this dispute, the Shach concludes that one should put up the mezuzah without a bracha or recite a bracha when putting up a mezuzah in a doorway that is obligated and then put up this mezuzah. ↑ Mezuzah Vehilchoteha 9:3 writes that if there are large items in a room such as a refrigerator or oven they don't minimize the space of the room and count towards the four by four amot since they are normally there and enhance the use of the room. His sources include: Halichot Olam v. 8 p. 285, Maharsham 3:263, Shevet Halevi 2:187, and Chovat Hadar 4 fnt. 22. ↑ The Shulchan Aruch YD 287;1 writes that a doorway is only obligated in a mezuzah if it has two doorposts and a lintel. Shach 287:1 quotes the Rosh and Rabbeny Yerucham who are strict if there's one doorpost on the right side and concludes that one should put up a mezuzah in such a case without a bracha. Kitzur Shulchan Aruch 11:11, Yalkut Yosef Sovah Semachot p. 546 no. 19, and HaMezuzah VeHilchoteha 10:4 agree. ↑ Shulchan Aruch YD 287:1 implies that a roof isn't a lintel, they're two separate requirements for a mezuzah. Accordingly, the Chazon Ish YD 172:3 s.v. mah writes that if the lintel doesn't extend downward to block part of the opening it isn't considered a lintel but just part of the roof. Shevet Halevi 2:150 agrees and proves this from Rashi Menachot 33b s.v. achsadra. However, the Mikdash Me'at 287:1:5 suggests that perhaps a roof can function as a lintel. Also, the Chovat Hadar 7:5 fnt. 8 equates the issue with that of having the edge of a roof function as a lintel to the opinion of the Rosh who holds that the edge of a wall can function as a doorpost. The Netivot in Derech Hachaim Siddur 239:1 also holds that a roof can serve as a lintel. Minchat Yitzchak 10:91 explains that a roof doesn't function as a lintel but if the roof has an edge where the door is according to some opinions it functions as a lintel. Yet, if the roof extends beyond the door in both directions it doesn't function as a lintel. He compares it to the Machloket Rama 630:2 and Magen Avraham 630:2 if there's doorposts and no lintel if that can serve as a tzurat hapetach. He admits that it seems not to be a proof though from further analysis. Adoney Paz 2:121:1 sides with the Chazon Ish though he recommends being strict for all opinions to put up a mezuzah without a bracha. Mezuzah Vehilchoteha 10:3 concurs. ↑ The Gemara Yoma 11a cites a dispute between Rav Kahana and Rav Yehuda if a storage room needs a mezuzah if it isn't used for anything else. Rav Kahana held that this was a dispute in the tenayim. The Rif (Mezuzah 6b) and Rosh (Mezuzah no. 15) hold that it is obligated, while the Rambam Mezuzah 6:7 holds it is not. Shulchan Aruch YD 286:2 accepts the opinion of the Rif. Yalkut Yosef YD 285:30 writes that one should put up a mezuzah without a bracha. ↑ Rav Hershel Schachter in “The Laws of Mezuzah” (min 0-2). Chovat Hadar ch. 2 fnt. 12 writes that it seems from the poskim that a storage room is only obligated because frequently a person goes in an out but if a person doesn't use it regularly he shouldn't be obligated. However, he admits that he didn't find the poskim who said this and instead it seems that they obligate a storage room in all cases. Igrot Moshe YD 2:141 holds that a stroage room is obligated in a mezuzah even if it isn't used frequently even if it is only used once every few years. Orchot Rabbenu v. 3 p. 165 quoting Rav Shlomo Zalman said that the minhag of Yerushalayim is to put up a mezuzah for a storage room even if it is only used twice a year (as explained by Arugot Bosem Menachot p. 334). Rav Elyashiv in Kovetz Teshuvot 1:117 implies that a storage room is always obligated as long as you have access to enter. ↑ Aruch Hashulchan 286:12-15 proves that the Bet Yosef's opinion that the bedroom needs a mezuzah and it is sufficient to have it covered with one covering. Yalkut Yosef YD 285:41 and Halichot Olam v. 8 p. 302 agree for additional reasons such as the Smag who holds that if the mezuzah is ten tefachim from the ground it is considered in another domain. Zivchei Tzedek OC 38 and Ben Ish Chai (Shana Sheniya, Ki Tavo, no. 16) are lenient and write that such is the minhag. ↑ The Gemara Yoma 11a establishes that a shul that no one lives in doesn't need a mezuzah. The Gemara 11b implies that the reason for this is that only a house that belongs to clearly designated owners needs a mezuzah excluding a shul that belongs to the community or public. Tosfot 11b s.v. shein accepts this understanding and says that a privately owned shul would require a mezuzah. He uses this idea to explain the Yerushalmi Megillah which speaks about a mezuzah on a shul unlike the Gemara Yoma and Brachot 47a that assumed that a shul doesn't need a mezuzah. The Rif (Hilchot Mezuzah 6b), Rosh (Mezuzah 6b), and Rambam (Mezuzah 6:6) distinguish between a shul in a city is exempt but in a village it is obligated because most likely people live in the shul building. The Shulchan Aruch YD 286:3 concludes that a shul does not require a mezuzah. The Rambam Mezuzah 6:6 writes that a shul doesn't need a mezuzah since it is an area of kedusha. There is a difficulty regarding the Rambam's opinion regarding its source from the Gemara Yoma 11b which seems only to apply this reason to the bet hamikdash. The Chatom Sofer YD 291 however explains that the Rambam means that even though the shechina dwells in the shul it isn't considered as though it is a house used for dwelling since it needs to be used for human dwelling to be obligated in mezuzah. ↑ The Gemara Yoma 11b treats a shul and bet midrash equally regarding mezuzah. Tosfot Yoma 11b writes that based on Yoma it sounds like there is no obligation to have a mezuzah for a bet midash, but Menachot 33a implies otherwise. Tosfot concludes that if it is privately owned or if it has a door from the bet midrash that opens into someone's private house then that door is obligated in a mezuzah. The Rosh (Mezuzah no. 10) writes that the Maharam Rotenberg learned from the Yerushalmi that a bet midrash should have a mezuzah. He added that a evil spirit bothered him when he slept in the bet midrash during the day until put up a mezuzah. Shulchan Aruch YD 286:10 concludes that a bet midrash does not need a mezuzah but since some say it should have one it is proper to put up one without a bracha. The Shach 286:19 explains that the reason to distinguish between a shul and bet midrash is that the talmidei chachamim live in the bet midrash day and night. ↑ The Gemara Yoma 10a establishes that according to the rabbis a sukkah does not require a mezuzah since it is a temporary dwelling. The Tur YD 286:11 extends this to a boat and store that are also considered a temporary dwelling which doesn't require a mezuzah. The Shulchan Aruch 286:11 concurs. The Taz 286:10 explains that even if the store is used every day it is exempt since no one lives in it at night. He adds obviously that if someone has a store in their house they require a mezuzah. However, the Perisha 286:22 wonders if store nowadays are exempt since they are permanent. In fact, the Pitchei Teshuva 286:14 cites the Yad Ketana who argues that a store that is set up for a temporary marketplace for a week or so is exempt from a mezuzah, but an established store requires a mezuzah. Kitzur Shulchan Aruch 11:14, Teshuvot Vehanhagot 1:647, Rav Poalim YD 2:36, Yabia Omer YD 10:58:28, and Yalkut Yosef YD 285:36 agree with the Yad Ketana. See further Halichot Olam v. 8 p. 302. Yabia Omer YD 10:58:28 holds that a mezuzah can be put up with a bracha. Yalkut Yosef writes that a mezuzah should be put up without a bracha because of the dispute but if someone recites a bracha they have what to rely upon. Teshuvot Vehanhagot holds no bracha is recited. The Ohel Aryeh 4:8 writes that perhaps the Taz would agree nowadays since the stores are open partially into the night and since it is used by day and night it is considered permanent. ↑ Lehorot Natan 3:72 writes that there should be a mezuzah from the elevator to the building. He writes that it is like a foyer (bet shaar) that leads to a house. Additionally he adds that according to Rabbi Akiva Eiger 286:13 even if it doesn't require a mezuzah itself it needs a mezuzah since it opens to a room that requires a mezuzah. ↑ Yoma 11a. Rama YD 286:1 quoting the Aguda that even if some non-Jews live in the city they are exempt from mezuzah on the city gate. The Taz 286:3 explains that the exemption is based on a danger. ↑ Chazon Ish YD 172:3 writes that even though the electrical posts with the wires on top can serve as doorways to enclose an eruv for Shabbat (under certain conditions) they do not need a mezuzah since the mezuzah won't be guarded and also some non-Jews might live in the city. Rav Hershel Schachter in “The Laws of Mezuzah” (min 48-53) explained that the factors why we don’t put up a mezuzah for a communal eruv are both because it might get ruined by weather or stolen. Additionally, it is because the Derech Hachaim Siddur writes that since the poles don’t devide the way the area is used (tashmisho echad) and it is more open than it is closed (omed murebeh al haparutz) for mezuzah purposes the poles don’t create a doorway. Therefore, an eruv doesn't require a mezuzah even in a Jewish community. ↑ Gemara Menachot 32b, Tur 289, Shulchan Aruch 289:2, Levush 289:2, Chayei Adam 15:17, Aruch Hashulchan 289:9. Taz 289:3 writes that the mezuzah is still kosher if the mezuzah isn't on the outer tefach. ↑ Rav Mordechai Eliyahu (comment on Kitzur Shulchan Aruch 11:10), Ben Ish Chai Parashat Ki Tavo Year 2: Halacha 4, Shevet Hakehati 1:277, Mezuzat Baitecha 289:6, Rivevot Ephraim 7:369. ↑ *According to Rav Hershel Schachter the rules are ordered 1, 2, 3, 4, 5. This is repeated in another shiur. According to Igrot Moshe YD 4:43 the rules are ordered 1, 2, 4, 3, 5. Teshuva M'ahava 1:61, Minchat Yitzchak 1:89 and 3:47, Chovat Hadar 8:1:4, Aruch Hashulchan 289:8, and Yalkut Yosef (Sova Semachot v. 1 Makom Vseder Keviyut Mezuzah fnt. 76) agree. According to Chelkat Yakov YD 161 the rules are ordered 1, 2, 3, 5, 4. Hamezuzah Vehilchoteha 11:12 agrees. According to Daat Kedoshim YD 289:11 the rules are ordered 1, 2, 5, 3, 4. ↑ Binyan Tzion 99 writes that a door from a place that isn't obligated in a mezuzah to a place that is obligated in a mezuzah should have a mezuzah on the right side going from the place that is exempt to the place that is obligated. His example is the closet that is less than 4x4 amot which is seen as an entrance from the closet to the room. Also, a front door to the street certainly has a mezuzah from the street to the house. Chovat Hadar 8:1:2 agrees. Rav Hershel Schachter in “The Laws of Mezuzah” (min 34-42) explained that this is the first factor by which a person determines on which side of the door the mezuzah is placed. ↑ Gemara Menachot 33b, Rambam Hilchot Mezuzah 6:12, Shulchan Aruch 289:2, Taz 289:3, Levush 289:2, Aruch Hashulchan 289:5, Kitzur Shulchan Aruch 11:3, Kitzur Shulchan Aruch of Rav Mordechai Eliyahu 11:3. ↑ Ben Ish Chai (Ki Tavo, Shana Sheniya no. 6) writes that if there’s a room that’s a dead end then it is obvious that we put the mezuzah on the right going into that room. Rav Hershel Schachter in “The Laws of Mezuzah” (min 34-42) agreed. Based on the Maharil (responsa 94) regarding courtyards and balconies this rule is obvious. See below. ↑ *The Levush 289:3 writes that the side rooms of a house which open to the main room which was warm in the winter should have a mezuzah going into the main room since it is used more than the side room. This rule trumps the direction of the door. This is accepted by the Shach 289:6 who comments that it is obvious. The Derech Hachaim 240:5, Kitzur Shulchan Aruch 11:4, Chayei Adam 15:18, Chelkat Yakov YD 161, Rav Hershel Schachter in “The Laws of Mezuzah” (min 34-42), Igrot Moshe 4:43:4 and Hamezuzah Vehilchoteha 11:11 agree. The Chelkat Yakov YD 161 proves that the Mordechai is the source for the Levush. The Mordechai cited by Bet Yosef YD 289 writes that the gemara needed a doorway to resolve the question of a man's room and a woman's room next to one another because they are both equally used and open to the public. However, between a vestibule or foyer and the main room of the house that is used commonly certainly the mezuzah is placed going from the vestibule and the main room since it is used more. He adds that this is also true even if the main room is also open to the public and the vestibule is open to a courtyard. The Chelkat Yakov explains the Mordechai to mean to add that even though when the vestibule is open to a courtyard and the main room to the public people will use the vestibule more often as an exit than an entrance, nonetheless, since the main room is used more than the vestibule, we view the entrance between the vestibule and the main room as an entrance and not an exit. In this he is proving that the rule of majority of walking is trumped by majority of usage. Igrot Moshe 4:43:4 writes that rule of majority of walking trumps the rule of usage and also the rule of doorway. His logic is that the room that is used more is only an indication of which way people walk a majority of the time but the main factor is the way people walk. He holds that the way people enter a majority of the time is an application of the deoritta halacha to put a mezuzah on the right as a person enters. ↑ Rav Hershel Schachter in “The Laws of Mezuzah” (min 34-42) holds that the factor of looking at the majority of the way people walk one room to another trumps the rule of the way the door is placed. Aruch Hashulchan 289:8 and Igrot Moshe YD 1:176 agree. Hamezuzah Vehilchoteha 11:12 holds that this factor is to be used after the door rule. Chelkat Yakov YD 161 agrees. ↑ The Yavetz 70 held that in a case of doubt that can't be resolved should have a mezuzah on both sides. The Maharam Shik YD 287 argues that this would violate the prohibition of adding a mitzvah, Bal Tosif. Strict: HaMezuzah Vehilchoteha 11:13 citing Mezuzat Beytecha 289:16 quoting the Chazon Ish and Minchat Yitzchak 1:9 agree with the Maharam Shik. Chelkat Yakov 162 holds that it is a rabbinic form of Bal Tosif. Lenient: Yabia Omer 6:2:6 cites the Binyan Tzion 100 and Rav Shlomo Kluger in Kinat Sofrim 40 who say that it isn't since one is pasul and one is kosher (Shulchan Aruch OC 34:2 and Magen Avraham 34:3). Rav Hershel Schachter in “The Laws of Mezuzah” (min 34-42) explained it was not Bal Tosif since one was only trying to be fulfill the mitzvah according to all opinions similar to wearing Rashi and Rabbenu Tam's tefillin simultaneously. See Rav Mordechai Eliyahu's comment to Kitzur Shulchan Aruch 11:4 where he rights that if there is a doubt as to which side the mezuzah should be placed there is a safek as to what one should do. Exempt: Igrot Moshe YD 1:176 holds that if the direction in which the mezuzah should be put because it isn't used more for entry than exiting, the rooms it connects are used equally, and there is no door, then there is obligation to put up a mezuzah at all. He quotes the Yavetz who says to put up a mezuzah on both posts out of doubt but he disagrees. He also rejects the opinion of the questioner to put up a mezuzah on the side of his choice. ↑ Mordechai Halachot Ketanot 962, Bach 289:5, Shach 289:5, Levush 289:2, Chayei Adam 15:17, Kitzur Shulchan Aruch 11:3, Aruch Hashulchan 289:5, Kuntres Hamezuzah (page 102, note 22). ↑ Maharil (responsa 94), Bet Yosef 289:3, Taz 289:3, Chelkat Yakov YD 161, Yabia Omer 6:23:6. The Chelkat Yakov writes that even though the Bet Meir and Chavot Daat ask on the Maharil since most poskim accept the Maharil we follow his opinion. His opinion is based on the concept that you walk from the house to the backyard and since the back door is an entrance to the backyard which has no other entrance then the mezuzah must be on the right entering the backyard. Rav Hershel Schachter in “The Laws of Mezuzah” (min 34-42) agreed. ↑ The Maharil (responsa 94) wrote that if the back door opens into a backyard that has a gate to a street then the direction of the mezuzah is determined by which way the door opens. Taz 289:3 quotes it. Chelkat Yakov YD 161 writes that even though the Maharil writes that when there are two doors to a backyard the mezuzah is determined by the way the door opens, the Levush holds that we would put up the mezuzah going into the house since it is used more than the backyard. Furthermore, the Bet Meir and Chavot Daat disagree with the Maharil altogether even when the backyard has no other exit. Therefore, the Chelkat Yakov concludes that since the house is used more than the courtyard that trumps the rule of the fact that the majority of the walking is from the house to the courtyard. Igrot Moshe YD 1:181 and Yeshuot Malko (Mezuzah 6:1) agreed with the distinction of the Chelkat Yakov of accepting the first case of the Maharil but not when the courtyard is open to the street. Rav Hershel Schachter in “The Laws of Mezuzah” (min 34-42) agreed. ↑ The Maharil quoted by the Taz 289:4 writes that if a house opens to enclosed courtyard and it doesn't have any other opening then certainly the doorway to the courtyard is considered an entrance to the courtyard since there's no other way in. However, the Bet Meir 289 argues with the Maharil and says that since the house is used more than the courtyard it is considered an entrance into the house. Chazon Ish YD 168:5 (cited by Yabia Omer) and Binyan Tzion (cited by Chelkat Yakov) agree with the Bet Meir. Maharam Shik 287, Maharsham 1:71 and 3:154, and Chelkat Yakov YD 162 agree with the Maharil against the Bet Meir. The Daat Kedoshim agrees with the Bet Meir unless it is an area less than 4x4 amot which might not be obligated at all in which case he follows the Maharil. Rav Ovadia Yosef in Yabia Omer YD 4:23:6 cites the Masechet Mezuzah ch. 2 which amazingly has an explicit dispute between the Tana Kama and Rabbi Yosi about this exact case where a house opens to a courtyard that doesn't have another entrance. Rav Ovadia quotes dozens of sources whether we generally follow Rabbi Yosi over Tana Kama or not and additionally if it is possible to disregard this source since it is post-talmudic. In any event, he is convinced of the argument of the Bet Meir but still follows the opinion of the Maharil being that he was quoted by the Bet Yosef and is an earlier source. ↑ Yabia Omer 4:23:6, Or Letzion 1:14, Hamezuzah Vehilchoteha 3:11. Or Letzion 1:14 writes that the minhag is to put a mezuzah on the right going from the house to the balcony. He explains that if the balcony is less than 4x4 amot it isn't considered obligated in a mezuzah in it of itself. Additionally, if it doesn't have a roof it isn't obligated in it of itself. However, since the balcony opens to the house which is obligated we can treat the balcony like a foyer (bet shaar) before the house which is obligated even if it is less than 4x4. However, the dispute is why the foyer is obligated. According to the Tosfot and Rosh it is only obligated rabbinically but it is obligated as a structure that is useful for its designated purpose. However, according to the Rambam, it is obligated Biblically because it opens to a house. According to the Rambam the mezuzah should be placed on the right side going in from the balcony since the balcony is only obligated as it serves the house. However, according to the Tosfot and Rosh the mezuzah should be placed on the right side going from the house to the balcony as it is obligated in it of itself. Yet, the minhag is just to put a mezuzah on the right side going from the house to the balcony like the Rosh since perhaps we follow the Rosh and even if we don't we follow the opinion of the Chikrei Lev who holds that the balcony door can't be considered an entrance for the house since you can only use it if you first exited through it. He quotes that this was also the opinion of the Rosh Yeshiva of Porat Yosef, Rav Ezra Attiyah. ↑ Hamezuzah Vehilchoteha ch. 3 fnt. 19 cites the Chiko Mamtakim p. 359 who quotes Rav Shlomo Zalman Auerbach has holding that a balcony that is 4x4 amot square or the equivalent should have the mezuzah from the house to the balcony like the Maharil, but if the balcony is smaller than that it should have a mezuzah on the right side from the balcony to the house like the Bet Meir, Chazon Ish, and Rabbi Akiva Eiger. ↑ Shulchan Aruch 286:2 obligates a storage area in mezuzah if it is 4x4 amot. ↑ Chamudei Doniel (Pitchei Teshuva 286:11) writes that an area that is meant to be used the way it is even if it is less than 4x4 amot is obligated in a mezuzah. Rashash Sukkah 3b s.v. may agrees. Or Letzion 1:14 assumes like the Chamudei Doniel. Mikdash Me’at 286:39 strongly disagrees with the Chamudei Doniel. Orchot Rabbenu v. 3 p. 165 quotes the Chazon Ish as holding that we do not hold like the Chamudei Doniel. Rabbi Simon in an article on mezuzot agrees. ↑ The Rambam (Mezuzah 2:6) holds that an area that is 2x8 amot is obligated in a mezuzah as would any area that is larger than 16 square amot. The Rosh (Mezuzah no. 16) disagrees and holds that unless it is 4x4 amot square it isn’t obligated. Shulchan Aruch YD 286:13 holds like the Rambam. Levush 286:13 agrees. The Shach 286:23 holds that it is obligated but the mezuzah should be put up without a bracha. Chayei Adam 15:6, Aruch Hashulchan YD 286:21, and Yalkut Yosef 285:24 agree. However, the Taz OC 634:1 argues that everyone holds it is exempt. Chazon Ish YD 169:4, Or Yitzchak 2:52, and Rabbi Simon in an article on mezuzot accept the Taz. Additionally, according to the Chamudei Doniel obviously an area that is 2x4 is obligated. ↑ The Maharil (responsa 94) holds that the mezuzah is placed on the right side going to an enclosed courtyard since the courtyard is closed and the only way to enter it is from the house so the entrance is from the house to the courtyard. The Bet Meir 289 argues since the house is used more than the closet. The Chavot Daat cited by the Bet Meir agrees with Bet Meir but doesn’t feel he is entitled to disagree with the Maharil. Our case is analogous to that of the Maharil. Majority of achronim accept the Maharil. Taz 289:3, Maharam Shik 287, Maharsham 1:71 and 3:154, Chelkat Yakov YD 162, Yeshuot Malko (Mezuzah 6:1), Igrot Moshe YD 1:181, Or Letzion YD 1:14, and Yabia Omer YD 4:23:6 agree with Maharil in this case. Binyan Tzion (cited by Chelkat Yakov) and Chazon Ish YD 168:5 agree with Bet Meir. Or Letzion YD 1:14 write that the opinion of the Maharil depends on the dispute between the Rambam and Rosh. According to the Rambam that a bet shaar is obligated because of the house that it is attached to the mezuzah should be on the left side and according to the Rosh the rabbinic obligation is for the bet shaar itself and accordingly the mezuzah should be on the right. Or Letzion concludes to place the mezuzah on the right because either we follow the Rosh or the Chikrei Lev. Yeshuot Malko (Mezuzah 6:1) advances the same argument. However, both Or Letzion and Yeshuot Malko conclude that we accept the Maharil. Igrot Moshe YD 1:181 rejects the entire question and explains that the Rambam would hold that the bet shaar is obligated in it of itself once it is attached to a place that is used for living. He accepts the Maharil. Our summary is that most accept the Maharil in this case and would hold to put up the mezuzah on the right side. ↑ Rabbi Akiva Eiger 286:13 writes that since the area is exempt from a mezuzah it can still be considered an entrance into the room. The Chazon Ish YD 168:5 agrees and adds that accordingly the mezuzah should be placed on the left side going from the exempt area into the room. Rav Shlomo Zalman (cited by Hamezuzah Vehilchoteha ch. 3 fnt. 19), Rav Hershel Schachter in “The Laws of Mezuzah” (min 34-42), Binyan Tzion 99, and Rav Heinemann (Star-K Kashrut Kurrents Winter 5779 p. 2) agree. However, the Chikrei Lev YD 129 argues that since the area is exempt in it of itself it is never considered an entrance just because you can enter it and then while exiting it enter into another room. That is considered an exit and not entering. Or letzion YD 1:14 isn’t certain if the Chikrei Lev is correct but he certainly considers his opinion significant. Yabia Omer 4:23:6 is also uncertain of Rabbi Akiva Eiger and cites Tzur Yakov and Tarshish Shoham quoting Lechem Hapanim who disagree with Rabbi Akiva Eiger. Igrot Moshe YD 1:181, Agur Bohalecha p. 739-740, Chesed Lavraham YD 91, and R’ Simon all agree with Chikrei Lev and reject Rabbi Akiva Eiger. ↑ Rabbenu Tam cited by Tosfot Menachot 33a s.v. ha, Rama 289:6, Levush 289:6, Chayei Adam 15:19, Minchas Elazar 1:36:1, Pitchei Mezuzahs 289:57, Chovat Hadar 9:footnote 20. Chovat Hadar 9:footnote 20 explains that the reason for this is that the opinion of Rashi says if you place it sideways it is not kosher, while Rabbenu Tam Menachot 33a s.v. ha holds that if it is straight up it is not kosher, so Ashkenazim try to fulfill the mitzvah according to both opinions. ↑ Kitzur Shulchan Aruch 11:5, Rashi Menachot 33a s.v. “bitechila,” Rambam Hilchot Mezuzah 6:12, Tur 289, Prisha 289:6, Shulchan Aruch 289:2, Levush 289:2, Chayei Adam 15:17, Pitchei Mezuzahs 289:24, Chovat Hadar 8:2:4, Teshuvot Vihanhagot 2:539. See Yabia Omer YD 2:21 where Chacham Ovadia Yosef quotes poskim who say that if it was placed higher than the beginning of the top third it should be moved without a beracha to there, but himself disagrees. ↑ Beit Yosef 289, Shach 289:4, Taz 289:3. ↑ Mezuzah Vehilchoteha 11:8 quotes Halichot Olam v. 8 p. 251 who writes that according to Shulchan Aruch if the mezuzah is within a tefach of the ceiling it needs to be fixed. He says that it is in disagreement with the Ben Ish Chai Ki Tavo n. 7 who writes that after the fact it is kosher. ↑ According to the opinion that the arched section is included the mezuzah should be placed at 60 inches (2/3 of 90) and above and according to the opinion that the arched section isn't included the mezuzah should be placed at 52 inches (2/3 of 78) and above. To satisfy both opinions one can place it at 60 inches where the doorpost is still vertical. ↑ Chovat Hadar p. 60 n. 35 writes that the Taz 287:2 in such a case says to place the mezuzah in the arched part like Rashi. He explains that even Rambam could agree since anyway there is a vertical doorway that is 10 tefachim. Chovat Hadar quotes achronim who disagree and side with Rambam. Shulchan Aruch YD 287:2 holds like the Rambam. ↑ Derech Hachaim 240:8, Pitchei Teshuva 286:10, Kitzur Shulchan Aruch 11:12, Chovat Hadar 8:2:2. Derech Hachayim 240:8 writes that if a doorpost doesn't reach the ceiling the mezuzah should be placed on that doorpost as long as it is ten tefachim tall. The Mikdash Me'at 286:36 establishes the case of the Derech Hachaim to only when the door reaches within a third of the entire doorway. However, the Keviyut Mezuzah Khilchata p. 389 points out that this Mikdash Me'at is a very difficult explanation of the Derech Hachaim. He agrees with the Derech Hachaim. Also, Chovat Hadar 8:2:2 p. 73 writes that if there are doorposts which are ten tefachim they are considered the right place for the mezuzah even if there is a wall which does reach the ceiling. Sechel Tov 289:73 quotes others who agree with the Chovat Hadar. However,  discusses this case at length and comes to the conclusion that it should be placed on the wall if the doorposts aren't shoulder height (spot א in the picture). In theory, Keviyut Mezuzah Khilchata 9:4 writes that there's two reasons why such a doorway would require a mezuzah. 1) The ten tefach posts are viewed as though they are extended up to the ceiling based on gud asik (Meiri Eruvin 11b, Sh"t Rav Eliyahu Mizrachi 2:26). 2) The posts don't need to touch the roof (Chesed Lavraham 16, Chazon Ish 170:3). Seemingly according to the first approach the mezuzah would be placed a third of the way to the ceiling, whereas the second approach would say to put it a third of the way up the post itself. He points out that another factor to consider is whether the mezuzah needs to be within a third of the height of the post or the doorway. ↑ Mezuzah Vhilchoteha 13:24 p. 123 citing Halichot Olam v. 8 p. 202-5. See Shulchan Aruch 288:13 and Yachava Daat 4:3 regarding the break between the paragraphs which for mezuzot doesn't invalidate. ↑ Shulchan Aruch YD 296:15 writes that a doorway that doesn't have a door is obligated in a mezuzah, however, some disagree. The Shach YD 296:25 writes that because of this dispute one should put up the mezuzah without a bracha, or recite a bracha when putting up a mezuzah in another doorway that is obligated, and afterwards put up this mezuzah as well. Similarly, Shulchan Aruch YD 296:13 writes the opinion of the Rambam that if the room has an area of 4 by 4 amot even if it isn't a square it is obligated in a mezuzah. The Shach 296:23 notes that the opinion of the Rosh is that the doorway isn't obligated unless there is a 4 by 4 amot square area. Due to this dispute, the Shach concludes that one should put up the mezuzah without a bracha or recite a bracha when putting up a mezuzah in a doorway that is obligated and then put up this mezuzah. ↑ Chovat Hadar 11:9, Kuntres Hamezuzah 289:8. Mikdash Miat 289:6 and Birchot Habayis 59:1 disagree. ↑ Kitzur Shulchan Aruch 11:7, Beer Moshe 6:6, Chovat Hadar (11:15:footnote 29), Kuntres Hamezuzah 289:7, Avnei Yashfei 1:207:3-4, Rivevos Ephraim 2:28:5. Orchos Rabbeinu (v. 3, p. 178 #38) however, disagrees. ↑ Kitzur Shulchan Aruch 11:7 writes that there's a doubt if one should make a bracha if a mezuzah was taken down to check it. ↑ Yalkut Yosef YD 285:93 writes that one should recite a bracha if they were taken down to be checked by a sofer. ↑ Maharam Shik YD 285, Rivevot Ephraim 7:239, Beer Moshe 2:92, Avnei Yashfei 1:207:1, Doleh Umashke (p. 275, footnote 69) quoting Rav Elyashiv and Rav Nissim Karelitz. ↑ Beer Moshe 2:92 writes that it is obvious that when putting up a mezuzah after it was taken down for two or three days that a new bracha is necessary. He says that it is obvious that a person had a hesech hadaat. He compares it to Shulchan Aruch 8:14 by tzitzit that was removed and put back on. Mezuzah Vehilchoteha p. 110 concludes like the Divrei Shalom 4:167 that one can recite a bracha when putting it back up but it is better to have them checked and make a bracha when putting them up. ↑ Ohel Aryeh 5:3 writes that a bungalow rented for more than 30 days requires a mezuzah, some say with a bracha and some argue. He cites the Tarshish Shoham 52 who holds that the mezuzah should be put up on the 31st day without a bracha since the bungalow colony is a temporary dwelling just to escape the city for the summer. ↑ Ohel Aryeh 4:15 explains that since the yeshiva bachur can be kicked out of his room and it isn't really a rental but a payment for a place to stay the yeshiva needs to put up the mezuzot in the dormitory. ↑ Kitzur Shulchan Aruch 11:24 writes that one should kiss the mezuzah in order to remind oneself of Hashem's unity. Kav HaYashar (ch. 1) writes that touching the mezuzah and offering a short prayer when one leaves one's house affords oneself protection from spiritual dangers. Orchos Rabbeinu (v. 3, p. 164) writes that the Chazon Ish looked at the mezuzah without kissing it when he passed by one. ↑ The Gemara Kiddushin 34a explains that since women can also use the reward of long life, written next to the parsha of mezuzah, the mitzvah of mezuzah also applies to them. The same appears in Yoma 11b. This is codified by the Rambam Hilchot Mezuzah 5:10, Shulchan Aruch YD 291:3, and Shach 291:4. ↑ Shevet Halevi 2:158:3, Kinyan Torah 2:58 and Chovat Hadar 9:3 write that women can put them up even ideally. Rav Hershel Schachter (Be'ikvei HaTzon p. 9) writes that the halacha follows the opinion that says women may put up mezuzot. Beer Moshe 2:100 and 6:79:5 as well as Teshuvot Vihanhagot 4:238:6 write that it is ideal for a man to put up the mezuzot, however, if a women did put them up, it need not be removed. ↑ Bava Metsia 101b-102a, Rambam Tefillin 5:11, Shulchan Aruch YD 291:2. ↑ Rav Ovadia (Yabia Omer YD 3:18, quoted by Hamezuzah VeHilchata p. 127) says that you could replace them with simple ones which are just kosher but it's better to do this as follows: take down the old mezuzot to get them checked, then put up the just kosher ones (make a bracha when putting those up), and then use the old mezuzot for where you are going. ↑ Chida in Birkei Yosef YD 291:2 writes that according to one answer of Tosfot one can take the mezuzot with you if you'll put it up right away, but according to the Ritva you can't. He says that we hold that one shouldn't take them down even if you'll put them up in another house right away, yet in an extenuating circumstance where you can't find mezuzot to buy for the new house you can take down the mezuzot. Aruch Hashulchan 291:3 cites this but is hesitant about it. This page was last edited on 14 April 2019, at 00:01.